HIGH POINT, N.C., Feb. 14, 2019 – A recent High Point University Poll finds that most North Carolina residents view Valentine’s Day as a rewarding holiday. On average, participants rated the holiday a 6.5 on a scale from zero (not at all rewarding) to 10 (extremely rewarding); translating to 59 percent of respondents reporting Valentine’s Day was moderately to extremely rewarding. Regarding the ‘stress factor’ that sometimes is associated with the holiday, participants reported an average score of 5.1 on a scale from zero (not at all stressful) to 10 (extremely stressful); translating to 30 percent reporting that Valentine’s Day causes no stress at all. These findings held true for individuals who were married, as well as single. A 2013 HPU Poll asked similar questions to North Carolinians at the same time with strikingly similar results. In 2013, participants rated the day as rewarding as 6.4 on average; translating to 61 percent reporting that Valentine’s Day was moderately to extremely rewarding. Participants in 2013 also reported an average score of 4.0. However, in 2013, a larger percentage (44 percent) reported that Valentine’s Day caused no stress at all. Despite their enjoyment of the holiday, results also found that a majority of North Carolina residents (62 percent) feel that Valentine’s Day has no influence on the closeness they feel for a romantic partner. This percentage is also close to what the poll found six years ago, when that number was 58 percent. 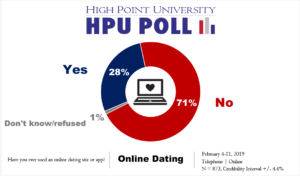 The HPU Poll also finds that 28 percent of all North Carolina residents have used an online dating site or app. That number is up seven points from four years ago when a February 2015 HPU Poll found that 21 percent of all North Carolina residents have tried online dating. Generally speaking, do you find that Valentine’s Day increases, decreases, or has no influence on the closeness you feel to a romantic partner? On a scale from 0 to 10, where 0 is not at all and 10 is extremely, please indicate how stressful the Valentine’s Day holiday is for a romantic relationship. *Average rating of stress for participants on a scale from 0-10 was 5.05. On a scale from 0 to 10, where 0 is not at all and 10 is extremely, please indicate how rewarding the Valentine’s Day holiday is for a romantic relationship. *Average rating of reward for participants on a scale from 0-10 was 6.46. What types of gifts do you typically give for Valentine’s Day? Do you personally know anyone who has used an online dating site or app? Have you ever used an online dating site or app? Do you personally know anyone who has been in a long term relationship with or married someone they met through an online dating site or app? 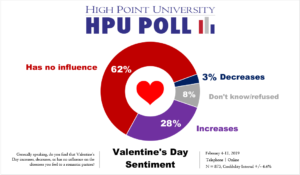 The most recent HPU Poll was fielded by live interviewers at the High Point University Survey Research Center calling on Feb. 4-11, 2019 and an online survey fielded at the same time. The responses from a sample of all North Carolina counties came from 873 adults interviewed online (594 respondents) as well as landline or cellular telephones (279 respondents). The Survey Research Center contracted with Dynata, formerly Research Now SSI: https://www.dynata.com/ to acquire these samples, and fielded the online survey using its Qualtrics platform. This is a combined sample of live phone interviews and online interviews. The online sampling is from a panel of respondents, so their participation does not adhere to usual assumptions associated with random selection. Therefore, it is not appropriate to assign a classical margin of sampling error for the results. In this case, the SRC provides a credibility interval of plus or minus 4.4 percentage points to account for a traditional 95 percent confidence interval for the estimates (plus or minus 3.3 percentage points) and a design effect of 1.3 (based on the weighting). The data is weighted toward population estimates for age, gender, race, and education level based on U.S. Census numbers for North Carolina. Factors such as question wording and other methodological choices in conducting survey research can introduce additional error into the findings of opinion polls. Details from this survey are available at http://www.highpoint.edu/src/files/2019/02/63memoB.pdf.